I know you're skeptical, especially with the recent financial market gyrations and uncertainty looming. Competition is intensifying... consumer sales are dropping like a rock... profit margins are squeezed and everyone starts hurting... humiliating foreclosures and bankruptcies violate one business after the other. Is your business next in line? The economy is stumbling... and no one seems to know how to fix it! But these are VERY exciting times, the IDEAL time to take action - IF and ONLY IF you learn how to exploit the situation to your advantage. In fact, this ‘market opening’ is your one-off, unique opportunity that could make you substantially wealthy, surprisingly with very little effort as long as you learn how to play a game only you can win. Are you running your business on YOUR terms? If you’re like most hard-working business owners and Internet entrepreneurs, you’re already struggling, trying to survive in your business just barely getting by. You’re trading your precious time for a meagre paycheque that when you think about it disgusts you and makes you angry… working RIDICULOUS hours in your business, week after week. When you think about it, you’re not making more money than you did 3, 4 or 5 years ago, but costs have sure gone up! Despite all your hard-work, and your ‘pig-headed’ determination to rob yourself of all the good things in life, you still can’t afford to take your family to a decent restaurant or go out with your friends and have a good time, let alone take a hard-earned vacation with the family. All your hard-earned profits keep getting flushed down the drain! You’re knackered from working from the time the sun comes up until the sun goes down. Heck, you probably don’t even get to see the sun whilst finishing work past midnight is not uncommon. I hate to say it, but you know it's true. Times are going to get TOUGHER. In fact, they are going to get really nasty before we see any daylight at the end of the economic dark tunnel we've just entered. In Australia, 6 out of 10 businesses go bankrupt or close their doors in the first 5 years of operation... and that’s an old, outdated statistic because in tough recessionary times, we’re living in, when everybody’s bleeding and hurting, things will get much worse, much sooner. That’s why you must know how to cushion the ‘blow’ that will soon knock ill-equipped business owners into a deadly coma. Many are hard-working family people who will drown in debt and will end up being kicked out of their homes, shamed and devastatingly humiliated. It has happened before it will happen again because history repeats itself over and over again. You need the power to defeat this economic crisis and put an end to the financial draught in your business and build wealth into the future. So you can live life on your terms no matter what the economy is doing. But, none of the money-making solutions you’ve relied on in the past will get you out of the on-coming mess. Corporates are axing employees left and right as we speak! And those are strong, billion-dollar mammoths with money-filled coffers. You can’t afford to take your sweet time about this. We’re already in the scrum. You must act now and do it decisively. You can’t afford to follow the masses since their knee-jerk reaction to this slowdown will continue cause even more chaos, confusion and volatility. You need your own precise compass to guide your through the dark tunnels of today’s economic mess. What you need is the ability to flood your bank account with cash, on demand. Why is this important in the darkest days of a recession? ...And there is CASH ABUNDANCE in your business. The only reason you can’t see it at present is because of the way our brains are wired. Y’see... the Reticular Activating System (RAS) in your brain helps you to filter the entire ocean of information swirling about you at all times to find precisely what’s important to you. Your RAS will attract more of what you focus on most of the time. What do you think hard-working business owners strapped with personal loans, mortgages, credit-card repayments and lease payments focus on during an economic slowdown or a recession? If all you do is focus on slow sales, low website conversions, no business, mounting bills and late penalties - your RAS will attract more of the same. It’s the Law of Attraction in action - it can work for or against you. That’s why recessions are almost assured since most people expect it, it’s only a matter of time... It's a self-fulfiling prophecy. Your brain, despite its brilliance, will work against you during the great times of distress – that’s why most business people panic and scramble during tough economic times like these. Simply because it will override your instinctive negative feelings like fear, panic and vulnerability that make you stuck, limited and frustrated. If today, you’re struggling with sales or can’t figure out how to attract more business, how will your SURVIVE once the recession starts to kill one business after the other? The Exponential Wealth Creation Mindset is not a formula or a set of magic tricks but a MINDSET that works ESPECIALLY in RECESSIONARY TIMES for EXPLOSIVE IMPACT – BOTH, online and/or offline. The Exponential Wealth Creation Mindset is what's going to save you in this 'recession' we're in. You must learn the Exponential Wealth Creation Mindset, when you do, EXPLOSIVE GROWTH will become as easy as paint-by-numbers as YOU paint the masterpiece of your new profitable destiny. You have HIDDEN ASSETS in your business or within your website. Un-utilised, un-leveraged, un-known assets that people are WILLING TO PAY for, RIGHT NOW, but they aren't because you're not allowing them to. They are right there, under your nose, but you can't see them - yet! I will help you uncover them. Do you feel trapped in your business? The only reason you get stuck in your business is because you can’t see a way out. And you can’t see a way out when your current mindset is working against you - you’re blocked off in a one-way, dead-end street to nowhere. Having an Exponential Wealth Creation Mindset will flood your thinking with an unlimited number of options and opportunities because the Exponential Wealth Creation Mindset knows no limits. SOCIAL PROOF: 153 practical, bottom-line business owners can’t be wrong! Recently, behind closed doors, I held and audience of 153 ambitious and pro-active business owners on the edge of their seats as I shared with them the Exponential Wealth Creation Mindset, at the 2008 Exponential Internet & Business Building Bootcamp. All 153 of them sat glued to their seats totally focused and excited for almost fifty minutes as they learned how a business – YOUR BUSINESS – can be leveraged to make money out of thin air especially in hard, economic times. For people in the room, the 47 minutes was a defining moment of their lives. Yet most people outside the room, in the distance were totally ignorant to what happened there and then. That’s the point. Most people are completely unaware of what the Exponential Wealth Creation Mindset is all about. And that’s why it works so well. Only the 153 people took pro-active action to take control of their destiny, the rest of the world thought they were too busy to do that. That’s why most people will be WATCHING as things happen to them rather than MAKING things happen and exploiting recession to their advantage. The difference is huge. One puts you in the VICTIM’S seat and the other in the MASTER-of-your-destiny seat. A simple ‘recession-proof’ strategy that will instantly boost your profits by 10-25% and more while giving you an EXTRA 1-2 hours EACH DAY! How to turn problems into solutions others will pay you TOP DOLLAR for and create money out of thin air – (This secret alone will help you to be a MASTER of your destiny rather than a helpless VICTIM). A simple way guaranteed to get your prospects and customers open their wallets and spend money with you PROVEN to work in lean times! How to spruce up your ads, emails and promotions so they have the greatest possible impact at HALF the cost and FLOOD your business with hard, cold cash on demand! What to do in your business during market slowdown so you don’t drown in debt or go bankrupt – PRICELESS strategy that could SAVE your life – literally! 8 Exponential Strategies to help you grow and prosper during recessionary times. The #1 strategy to help you out-smart, out-strategise and out-earn your competition during a recession. How to avoid making costly mistakes that could put you out of business – mistakes that are totally predictable and preventable. What to do when the recession hit new records low. 3 exponential strategies that will leave your competitors bewildered but will help you to accelerate your recovery after the recession sooner than your competition. And a truckload of tips, strategies, techniques, tactics and skills guaranteed to help you armour-plate your business and secure your financial future during recessionary times. 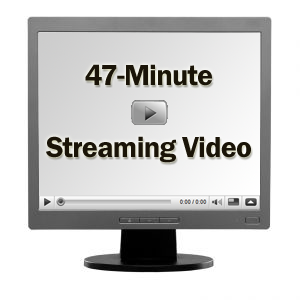 This 47-minute video stream recording contains real, practical value. No fluff. You’ll learn ONLY what's relevant to you, so you start getting READY and PREPARED to exploit the downturn crisis to your advantage and protect yourself from a catastrophe. It is a totally unedited 'cut the crap' and tell-it-like-it is that will have you play the video over and over so you don’t miss any piece of profit-triggering, wealth-shielding information. Just one simple idea, could mean the difference between staying in business and going bankrupt and getting kicked out in the street with no hope. The beauty about this Exponential Wealth Creation Mindset is that it’s fun, easy-to-understand and practical that you can start to apply the very next day in your business or on your website to make sure your business moneymaking arteries don’t get clogged up with recessionary fat waste that will cause thousands of businesses pain, suffering and ultimately a deadly heart attack. STOP WORKING RIDICULOUSLY LONG HOURS FOR A MEASLY PAYCHEQUE - Start to generate 'extra' PASSIVE income THIS month. I want to help you - help you avoid the deluge of bankruptcies that are about to come rushing down like a torrential downpour on honest, smart, hard-working entrepreneurs, business people AND Internet marketers - people just like you. DON'T DROWN IN THE FLOOD OF BANKRUPTCIES THAT IS IMMINENT - Catch the wave of opportunity that Exponentially Minded Entrepreneurs will be riding all the way to the bank! People who didn't see it coming, thought it was going to happen to 'someone else' or saw it coming, but had no clue what to do about it. It's going to get so bad EMPLOYEES and MIDDLE MANAGERS are going to get the axe. Large corporates are not the only employers planning to let a lot of staff go. They are just one of the few employers warning employees it's coming. Most employees will find out on the day they've lost their primary source of income. Business people are going to go to wall and lose a lot more than that, many losing everything they've worked for. Some will get divorced because their wife/husband will blame them and a few will have a heart attack, a stroke or other physical manifestation of the stress and strain of the economic catastrophe. Just wait until petrol prices hit the new records high of $2 or higher, they’re already talking about it. And we both know, how much fuel costs affect everything we buy. If you’re already cash-strapped, what’s your back up plan for the next year? Because your family, your employees, your creditors will look up to you for answers. YOU HAVE BEEN FOREWARNED, BUT WHAT ARE YOU GOING TO DO ABOUT IT? Nothing? Good luck - you're going to need it - the numbers are stacked against you. Want to do something about it, but don't know what to do next? DON'T BE A VICTIM - DO SOMETHING ABOUT IT NOW - BEFORE IT'S TOO LATE! You know there will be 'survivors' - there always are. They do something the others don't. They get information like I am going to start sharing with you TODAY/TONIGHT in fact RIGHT NOW, as soon as you decide to take control of your future. Information that will shield you, your business and your family from the imminent catastrophe. An Exponential Wealth Creation Mindset is the only strategy proven to withstand financial hurricanes and floodwaters time after time. The Exponential Wealth Creation Mindset will help you, not to SURVIVE, but to THRIVE in the midst of tough economic conditions and create hoards of money out of thin air – literally! If you don’t get control of your business, there’s a chance you’ll take a direct mortal blow – and lose everything! Everything you’ve worked so hard to achieve... your home, your security, your dreams, goals and plans... all wiped out in an instant. And nobody will be there to help you. Not the government or the bank or... nobody! Now is the time to bullet-proof your business and secure your wealth by learning the Exponential Wealth Creation Mindset. So you can whack the recession ‘monster’ and THRIVE in your business today, next week, next month, FOREVER! The entire session was captured on an A4 page as a MindMap. A skilled artist arrested and sketched each key point for easy reference. This is to make sure, that each tip, strategy and main point is there on one sheet of paper so you can see it at a glance and take action immediately. This will become your blueprint or action plan of what to do during recession – when there is not time to waste and split-second decisions can make or break your business and financial future. Not having this information at your fingertips could make you make all the wrong decisions when push comes to shove and fear overrides your ability to think. Of course, that’s not likely to happen when you have a way to protect yourself. And now using the MindMap it’s easier than ever. This exponential bonus will explode your sense of possibility and give you an instantly unique way to promote yourself and your business. The best thing is that it’s free and most of your competitors don’t know anything about it. PLUS you’ll find it’s a fun way to kaleidoscopically spruce up your emails, ads and promotions using emotional hooks GUARANTEED to get your customers and prospects to pay attention to your sales communications. This tool will help you to grab your readers by the throat and shake them to action by connecting with them on a deeper subconscious level. This secret tool will make your brain synapses fire up to make your ads, emails and promotions WORK BETTER especially during these turbulent financial times. You can’t get this tool anywhere else. It’s ONLY available as a bonus to this product! This bonus is PRICELESS. It will give you a health check of Australian businesses. And it will scan and strip your business naked right in front of your eyes in less than 29 minutes. The good thing is, you're the only one watching! This report is vital reading for any SME owner who want to avoid the chronic diseases that are destroying too many Australian small businesses. With the Exponential Wealth Creation Mindset, there is NOTHING you can't handle - EVEN A RECESSION. In fact, a RECESSION = OPPORTUNITY. It's when your competitors are going to PANIC, SCRAMBLE and BE TOTALLY CASH-STRAPPED. That's GREAT NEWS for you - terrible news for them. The Exponential Wealth Creation Mindset is all about LEVERAGE. LEVERAGE is all about doing MORE with LESS. When is that more important than right now? THOSE who will be left standing will reap ALL the rewards. Make sure that YOU are one of the survivors. Make sure YOU BULLET-PROOF your business, career or website. Make sure YOU FUTURE-PROOF your wealth and income when everyone around you runs scared. You either get ready to take the hit, or you get knocked out. There is no easy or soft way to say it. ... AND MASSIVELY PROFITABLE for some. I want to make you a one-off irresistible offer so you take action RIGHT NOW to protect yourself. The 47-minute video recording and all the bonuses are only for people who are proactive and decisive enough to take action NOW. Let’s face it. If you have read this far, you know you must take definite steps to protect yourself. Using the Exponential Wealth Creation Mindset it’s easier than ever. Step up and learn what actions you must be taking TODAY so you don’t get drowned in the flood of bankruptcies that you know are coming. Our economy has never TANKED this hard... on so many levels! That’s why NOW is the time to get READY for the recession. The 153 already took pro-active action to inosculate themselves and their families. You owe it to yourself, your family and your financial security to learn how you can use the downturn to your advantage.